I have the exciting news that Mihoko Wakabayashi, of SAORI Worcester, Massachusetts is coming to visit SAORImôr in January. We have set up a few workshops and although the notice is very short I sincerely hope as many of you as possible will be able to come. As well as the workshops there will also be a lecture/demonstration. All the workshops will take place at SAORImôr and the lecture will be in the Pontio Arts Centre. SAORI Worcester was the first SAORI studio in the US and was established in 2000. Mihoko’s background is in alternative education and she found in the philosophy of SAORI teaching a way to share her passion with individuals and local groups to create a fully inclusive community at her studio. 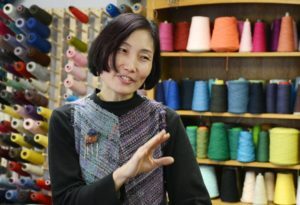 She runs annual tours in Japan looking at Japanese culture and visiting working artisans. She is currently researching various aspects of Japanese textile crafts. A chance to meet Mihoko. Deepen your knowledge of the SAORI philosophy. Learn a few Japanese words! Open event, no booking required. Venue: Cemlyn Jones lecture room (PL2) level 2, Pontio. 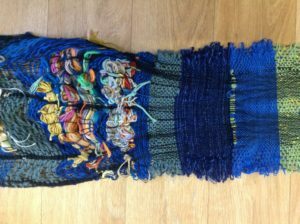 Japanese Culture and Innovation Through the Practice of SAORI Freestyle Weaving, its Origins, Meaning and Philosophy. 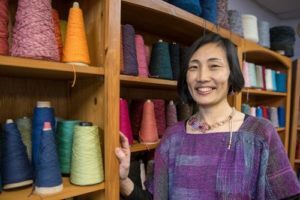 Come and hear Mihoko talk about the Japanese art of SAORI weaving and what it means to her. Learn how the philosophy relates to Japanese culture and see the work of other practicing artisan studios. Understand how we feed our natural human curiosity with Self-Innovation Through Freestyle Weaving to inspire intuitive creativity and stimulate innovative design. 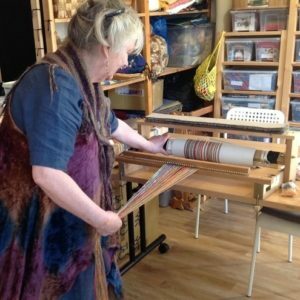 This is your opportunity to learn about this new and oh-so-easy method of warping your loom or to remove any problems you have if you have already tried it. You will find that whatever your experience there is always more you can learn. Mihoko will be demonstrating various techniques learned through many years of SAORI experimenting and discovery. She has so much experience and knowledge you will be bound to find the answers to those “how do they do that!” questions. Learn the mysteries of SAORI clothing. Gain confidence in cutting your cloth. 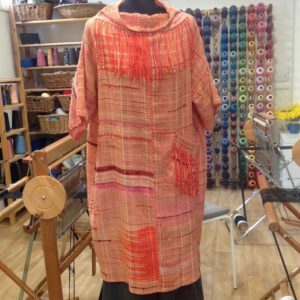 Understand draping and placing your cloth to create your own one-of-a-kind garment. Be inspired to ‘let your cloth tell you what it wants to be’.